Come Party with the Party! 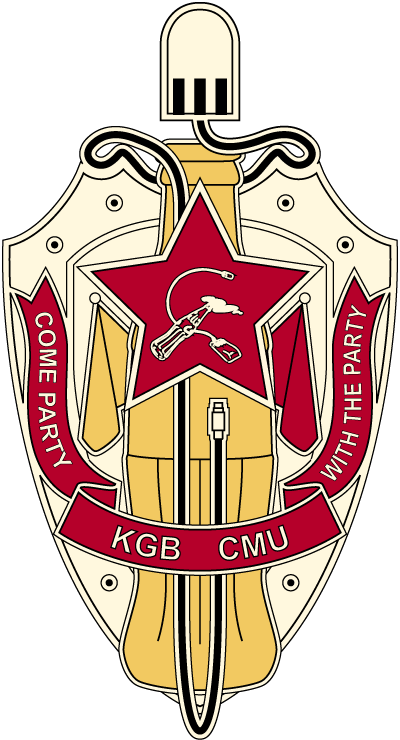 This is the front page for the CMU KGB. Isn’t it captivating? I know you’re impressed. We are. Looking for the T-shirt survey? Who are we, the KGB, and what do we stand for? That’s an excellent question… In short, we’re a social organization for folks with a good sense of humor and a bit of whimsy. Want to know more? Visit our “Who are we, anyway?” page and soak your brain in knowledge. News about events, meetings, Pravdas, and other exciting updates can be found in the various Post categories. Click the “News” link above or take a look at the sidebar titled “Exciting Things” for super fun KGB updates. Want to know more about our valiant leaders? Take a gander for some completely unbiased and 100% true background information. Need to contact us? We have email addresses and Facebook groups if smoke signals and semaphores aren’t your thing.